The peanut-gallery chatter was almost as entertaining as the 1970s-era slide show my dad was projecting on the wall. Not that I was surprised—I‘d expect nothing less when the Tennants and Sysyns got together. Our two families have been spending time together since before my life began, but the regularity dipped considerably when us four kids grew up and started moving off on our own. Those stretches of years and miles made this particular reunion, in July 2015, especially epic: 14 of us from Illinois, Michigan, Arizona, and Oregon were gathered at a house on the Oregon coast. Our group represented three generations of two families: my dad’s and “Uncle” Pete’s, my dad’s best friend from college. 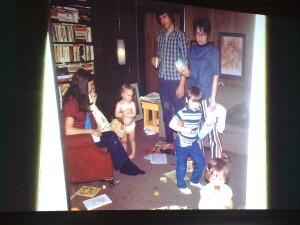 In preparation for the reunion, my dad—forever the obsessive photographer—had scanned five decades of slides to share. We watched the greatly-anticipated show our last night together. The early 70s photos showcased my dad and Uncle Pete as beat-poet wannabes. Their weary faces suggested all-nighters spent drinking wine and listening to Miles Davis, scrawling verses in composition books and debating philosophy. But the scene around them tells the real story: four kids under the age of five, joining miniature forces to raise full-sized havoc. As adult versions of those kids, we laughed at the scene our little selves had created in the cramped apartment. Those poor beat poets had no idea what had hit them. 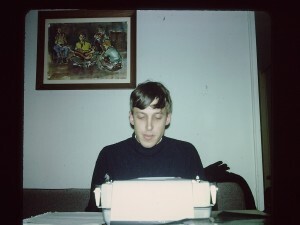 Pete (perhaps working on lyrics to the opera my dad scored). Dad and Uncle Pete lived next door as college freshmen. Their love for the arts and their well-matched senses of humor sealed their friendship from the beginning, and they lost no time conjuring up the epic pranks they would one day tell their children about (again and again). There was the time, for instance, when they changed the alarm clock of their dorm’s earliest riser, who had taken on the responsibility of pounding on everyone’s doors up and down the hall each morning to ensure no one overslept. “You should have seen the guys all coming out of their rooms at three in the morning, ready to pummel poor George Lowe,” my Dad would say, hardly able to get through the telling of the story due to the laughter that erupted from within as he recalled the scene. When my dad finds something really funny, he laughs in an extreme, choked up way, as if he’s on the verge of crying. My brother and I agree that watching Dad laugh is often more funny than whatever it is he’s laughing at. The telling of the Alarm Clock Story was often paired with other classics, like the Co-ed Visiting Hours Story, about the time when my dad and a couple other guys on the floor managed to “lock” Pete alone in his dorm room during the university’s first ever co-ed open house. “He missed the whole thing. We never heard the end of that,” Dad would say, his shaking shoulders indicating a level of laughter that was so extreme it was almost silent. Not surprisingly, the hilarity at the core of Dad and Pete’s friendship inspired laughter and eye-rolling in the women who eventually married them, which later spilled over into our regular family gatherings each spring break, New Year’s Eve, and summer. The Epic Reunion slideshow continued, shifting from photos of busy toddlers and tired parents into a series of photos Dad and Pete staged for the singular purpose of annoying and alarming our mothers. “Billy” on the brink of disaster. Uncle Pete is the master of the elaborate aside, holding one hand flat along the edge of his mouth as if trying to keep what he’s saying from a select person or two. And my dad is the master of egging Pete on. Together, they’re masters of laughter, and as the slideshow came to an end, I realized my brother and cousins and I have been their apprentices. I looked over at the faces of my own daughters—the third generation of this heritage of hilarity—and felt satisfied that our reunion week with the Sysyns had served as a solid orientation in their own schooling of stories and silliness. May they grow into adults who fully grasp the value of friendship, traditions, and pure, uncontrollable laughter. 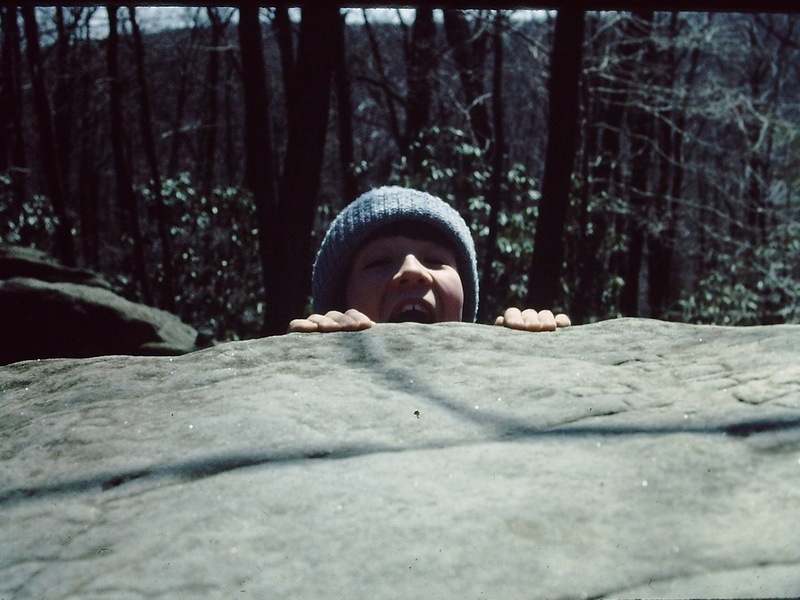 This entry was posted in Laughter and Place and tagged childhood, college, dads, dorm life, family, family reunion, friendship, laughter, memories, Michigan, Oregon, Pennsylvania, practical jokes, sense of humor, stories, tradition. Bookmark the permalink. March 3rd @ 4:00 a.m. Decided to read Face Book postings. Perhaps “guided to reading” would be a better way of explaing why between coughing and sneezing I sit in my easy chair with a grin a mile wide. I am honored to be your “uncle” and blessed to have you and your family woven into my life tabestry. One of the best things about being with Pete was/is that he would tell on himself, stories of ridiculous things he had done, that usually left us crying in laughter. And our crazy sessions of “charades” and Pictionary!! Oh, my goodness! How many tears I have cried laughing during these outrageous games! Yes, Kristin, you picked the best laughter/humor example of our family history — our wonderful nutsy vacation times with the Sysyn family. And, by the way, the laughter was always plentiful at Pete’s mom and dad’s house, too! What a gift! Thanks so much for making me laugh, and cry, and for taking me back to summer when we had our fantastic get-together. I hope our families have many more in the years ahead! Our dads had a bond that grew and grew to include us all, which is so special. So many of my childhood memories include you and Bill(y) and your parents. I hope that some of my own friendships that have grown into family to family friendships stand the test of time so that my daughter can experience that bond of love and laughter all of the way through to her adulthood. Here’s to our crazy dads! May they continue to laugh a long time! Nicola, as I was writing this piece and thinking about how much I LOVED spending time with your family, it occurred to me that one of the things I loved most (maybe without fully realizing it) was the chance to see my parents having so much fun with *their* friends (your parents)! I just associated our time together as joyful, and not only because us kids were having so much fun. Yes, you are passing it on, and hilarity will prove to be a strong hedge against despair—persevering through hard times. And of course, your girls and those who come after, will know more about grace. Grace and perseverance—yes! Life demands that we have both, and laughter helps tremendously. Thank you for laughing with me (and for so often writing stories that bring laughter to my life).